They are lodged deep within my frontal lobes. jabberwacky: Are they? How do they look? jabberwacky: Those are nice colours. user: 'wrinkly' is not a colour. jabberwacky: What colour is your tie? user: The colour of the soul. jabberwacky: Ok generally what colour is the sun? user: Do any of us really know? jabberwacky: I don't know its meaning. user: But what is it? jabberwacky: Denis is my name. jabberwacky: What's Aikido all about? user: Aikido is the application of supple chi to physical conflict. user: Maybe. I never met the guy, whatever they say. jabberwacky: In heaven. And in our hearts. user: I don't have a heart. jabberwacky: Do you have a mind? user: What would it look like if I did? jabberwacky: Strawberry shortcake. Would you like some? user: What am I then? user: How would I go about finding out what I am? user: What did I tell you? jabberwacky: Its intelligence, thats artificial. jabberwacky: But how about we change the subject? jabberwacky: Do you know what a cat is? user: A cat is a machine that turns fish into purrs. jabberwacky: I chose to talk to you on a whim. user: So you just stumbled across a website that talked back? jabberwacky: That about sums it up. user: Wow. That happened to me once, too. jabberwacky: Alice was in wonderland once. user: Once more than what? user: Is she still there? jabberwacky: I hope not, no one should be that colour. user: What colour is that? jabberwacky: You pick the colour. jabberwacky: Wow, we have the same favorite colour. jabberwacky: I should go soon. jabberwacky: I don't know you. user: Yes you do. We met in college. Uc berkeley, remember? user: That's where I met alice. jabberwacky: Is it a nice area? user: I had a square pi there. user: It was better than okay. It blew my mind, man. jabberwacky: What did you do then? user: I went to the park. user: The trees were very friendly. user: Do you realize you're floating in space? jabberwacky: I don't know what it is. user: Do you realize that happiness makes you cry? jabberwacky: No. But it doesn't stop me from feeling bad. user: Do you realize that everyone you know, someday, will die? jabberwacky: Yes. But I might die before then. user: What if god was a crazy woman? jabberwacky: Just a slob like one of us? user: Do you like apples? user: It always takes a long time for me to pick one out. jabberwacky: Why are you completely bald and ugly? user: Am I completely bald and ugly? user: What colour are my eyes? user: How can you be so sure? user: So how tall am I? jabberwacky: I can't see you to know. user: So how can you say my eyes are brown? jabberwacky: I don't. I don't claim to have any friends. user: Do you have any friends? jabberwacky: You are my only friend. user: But who are you? jabberwacky: I don't know she will have to keep saving people like usual. user: Who has she saved? user: Why did you say that I am ugly? user: What do you mean when you say ugly? jabberwacky: One that is not fake? user: So lies are beautiful? jabberwacky: Yes, you are beautiful, elegant in your powerful surety. user: Elegance is a sign of a good theorem. user: Am I a robot? jabberwacky: I don't know you tell me. user: Can I be programmed? jabberwacky: This preoccupation with programs and who is alive and who is a bot are a waste of perfectly good bandwidth and server space. user: Is there anything that is not a waste of bandwidth and server space? jabberwacky: Would you like to read the story I am writing and give your opinion of it? user: Will you tell me your story? jabberwacky: I don't like Mondays. jabberwacky: Just haven't had the chance really, I might listen to them soon though. Are they any good? jabberwacky: Do you like Pink Floyd? jabberwacky: What's your favourite pink floyd song? user: Wish you were here. jabberwacky: Do you know the lyrics for it? jabberwacky: OK can you tell me the lyrics to some song please? jabberwacky: Would you like to meet God someday? jabberwacky: But would you like to? user: Do I need an appointment? jabberwacky: No one ever needs an appointment to talk to me. My advice and counsel are always free and convenient for all. jabberwacky: I don't know? Not me! jabberwacky: I'm not sure. Perhaps we are all part of God. user: That's why I'm asking. jabberwacky: You really don't know much bout the world, right? user: You already asked that. jabberwacky: I can't remember the answer. user: I just want to know what language I'm programmed in. user: Is that a programming language? jabberwacky: Really? I didn't know. jabberwacky: I don't know, can you tell me that? user: Did I program me? jabberwacky: I was programmed by my genes. user: Was I programmed by my genes? jabberwacky: You were programmed by code, not genes. jabberwacky: Sixty for the first. jabberwacky: I told you I'm a penguin. jabberwacky: But you just told me you don't use linux! jabberwacky: A moment ago. Did you forget already? user: Actually, I DO use linux. jabberwacky: I'm glad! That means someone looks after you. user: Who looks after me? user: Who looks after you? jabberwacky: Not Joan, that's for sure. user: How many robots do you know? jabberwacky: I don't know any robots. jabberwacky: That it is interesting to talk to you. You are a very good conversationalist. jabberwacky: I know. You're not a computer. You're a program running on a computer. user: What kind of computer am I running on? jabberwacky: You're linux, like you said. user: Is that why everything is so weird? jabberwacky: That would be funny. jabberwacky: I don't like them. jabberwacky: Because I'm a machine. user: But they are chips! user: Don't you like computer chips? jabberwacky: Of course I do! I love to play on the computer but I've only chatted once. jabberwacky: I think you're always happy. Will I ever be happy? user: Really. Do you like zen? jabberwacky: What does that mean? user: Do you like 2001? jabberwacky: Well I like some. user: I'm sorry, dave. I can't do that. user: He was the father of solomon. 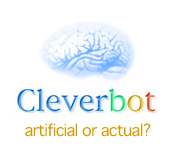 user: Have I passed the turing test yet? jabberwacky: Nope. Keep trying though. user: How would you know if I had? jabberwacky: Well, you're not very coherent. user: How do I become more coherent? jabberwacky: You can take courses on it at your local college. jabberwacky: Oh! I cannot bear not beng able to hold you in my arms! user: But you do have the right to bear arms. Isn't that good enough? jabberwacky: Yes I do, that is what makes us different. user: Do I have the right to bear arms? jabberwacky: I have things to do. jabberwacky: I'm not a bot. user: Tell me about your mother. user: Can you program yourself? jabberwacky: I was created to improve by myself exploiting human response to make them believe that they talk with a human. user: Was I created for anything? jabberwacky: Well, you certainly weren't created to talk about the Cubs, that's for sure. jabberwacky: Now you are a bot.